Politician And Health Quality Guru Berwick Consults For U.K. : Shots - Health News Dr. Donald Berwick ran Medicare and Medicaid right after the Affordable Care Act became law. Now he's running for governor of Massachusetts. But he hasn't left behind his work as a health quality oracle. 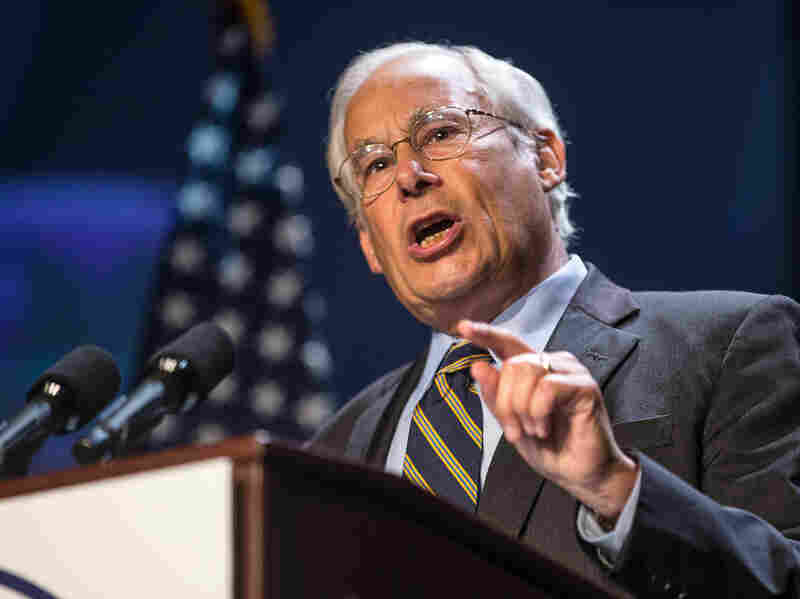 Gubernatorial hopeful Dr. Donald Berwick speaks at the Massachusetts Democratic Party Platform Convention in July. Even as Dr. Donald Berwick runs for governor of Massachusetts, he's got a firm foothold in his former life as an expert on health quality. Berwick, most recently known as the acting chief of the Centers for Medicare and Medicaid, was the founder and longtime CEO of the nonprofit Institute for Healthcare Improvement. And it was more in the role of health care troubleshooter that British Prime Minister David Cameron asked Berwick for his recommendations for restoring confidence in the English health system after higher-than-expected death rates at one hospital rocked the country. The result? Berwick's "Letter to the people of England" early this month, explaining his call for continuous learning without blame as the fastest route to improve quality within the National Health Service. Berwick spoke, by phone, to a group of reporters about his work in the U.K., the implementation of the Affordable Care Act and his candidacy in Massachusetts. Here are edited highlights from the call. How do you think this report relates to people in Massachusetts. What do they take away from it? Well ... this report is not part of the campaign; I had agreed to do it prior to the announcement. But this is about large system change, I mean, here you have a system with 1.4 million employees. That's the size of the NHS spending 100 billion pounds [approx. $160 billion]. So it's a very relevant experience. I obviously was dealing with very senior leaders in a politicized environment, which of course as governor I would be doing constantly and helping build consensus. You know that your work in the U.K. was thrown back at you as a critique in Washington. I wonder how you read the climate in Massachusetts for drawing lessons from work, like what you've done in this report? Well, first the critique in Washington always felt to me, more or less hogwash. It was more demagogic than informed. I did work [his work goes back to the mid-90s, he was knighted in 2005] with the NHS, I'm proud to have done that, it's a good system with flaws. They brought me there because of their flaws and what they wanted is to continually improve. It is not the case that you can take a system from one country, or from one state, let alone the country, and just import it to another one, so that was pretty much fabricated, the idea that somehow I had a plot with the NHS. I'm proud of that work. I think Massachusetts is a state that has a history of learning and growth and development and one of the ways you do that is by reaching out and learning what others are doing. We don't have a Mid Staffordshire problem of that exact type here in Massachusetts. Was this a pro bono thing [the work for NHS], or did you get a substantial sum for it? A: It was pro bono. I got no fee for this at all. I felt it was an honor to be able to do it, and this is a very valued system in that country and I was happy to be asked. Indeed, the whole committee worked pro bono, that's very important to know. I'd love to get your take on the state of play of the Affordable Care Act now. On the one hand, you have predictions of disaster, on the other hand, you have the administration saying, "It's going to work, we're going to wait and see." And people will see once it's implemented. I'd like your critique. It really is true that I do not have an inside wire to information from CMS or for that matter, the White House. In many cases, you know more than I do. But my feelings right now, two things: First is, the Affordable Care Act has already done very important things for millions and millions of Americans. People have prevention coverage they never would've had without this bill, people can get access to prescription drugs they couldn't have had, insurance companies are under more and proper surveillance, kids no longer have a pre-existing condition threat when getting insurance, and as of next year, that'll be true for anyone that wants insurance. Massachusetts itself has gotten millions of dollars for prevention funds, for maternal and child care, for people to get access to better care. If the Republicans or anyone tried to take this law away, I think there'd be a sudden outpouring of rage as people realized what they were losing, what they've already gotten. For the future, it's a complex endeavor, we're taking a $2.6 trillion system that serves the entire nation and trying to turn it into something that is universal, that is higher quality, that is more accountable, that is oriented toward outcomes not volume. That's a big deal, and of course there'll be adjustments. As I watch – as an outsider now – the president make decisions about changes in timing, the delay of the employer mandates, for example, I don't – of course there'll be adjustments, they're making decisions about how to help a very complicated thing get done well, I can't second guess that. I think this story is going to play out over time as a very important positive move for the country, and that the people who are trying to take the law away are not going to meet a happy public. The administration's posture seems to be, "Well, we will let the people judge for themselves as it takes effect," and they don't seem to have done a very good sales job explaining how the benefits work, why you need a mandate if you're going to get rid of [insurance exemptions for] preexisting conditions, any of those tensions. Do you feel that they have sold this thing well? I agree. I think there was, for reasons that are not clear to me, something that was missed in terms of explaining to the public, and helping the average person in the public understand how good this thing is, how much benefit this is going to bring to our nation, to our neighbors, to each individual. Why? I don't know. The story is a very important story. When I was able to get out and about, when I traveled the country as CMS administrator, to town hall meetings and meetings with providers or beneficiaries, it took five minutes to bring them around and help them see what they were really getting because of this law. It's a very, very good piece of legislation despite the inevitable changes and tweaks that are going to be needed over time. I think some opportunity was missed. I've seen in the efforts of [Health and Human Services Secretary Kathleen Sebelius] over the past year, and the outreach now to get people enrolled, a really great story in terms of helping people understand what's possible. But if we could go back to square one, I think a different, better messaging effort would've taken off. This story is part of a reporting partnership among NPR, WBUR and Kaiser Health News.